The Whole Beauty® Institute offers a variety of skin rejuvenation treatments and maintenance regimens to improve a variety of skin conditions. Restore your skins foundation with enhanced oxygen therapy. Hyperbaric oxygen, long known for its healing properties, can now be used to help restore your skin’s structure and resilience. We create a bubble of pressurized oxygen on the skin’s surface to deliver a mixture of hyaluronic acid, vitamins, and antioxidants into your skin. This produces an improvement in skin tone, a reduction in fine lines, and an overall radiance to the skin. You will notice the benefits immediately, but will experience continued improvements over the next several days. We recommend a series of 6 weekly treatments, as this will provided your skin with the maximum cumulative benefit. To maintain your result we recommend refresher treatments every 4 to 6 weeks. The benefits of enhanced oxygen therapy can be extended further with our custom program of Whole Beauty medical grade skin care products. Allow our medical aesthetics team to create a custom portfolio of products that is specifically suited to your skin. Improve the appearance and texture of your skin and help reduce the appearance of enlarged pores and revitalize dull skin with MicroDermabrasion. MicroDermabrasion is a gentle, gradual exfoliation of the skin’s surface cells that reduces damage caused by age, sun and other environmental and hereditary factors. MicroDermabrasion at our Chicago centers is performed by a member of our highly skilled team under the close monitoring of Dr. Cook. 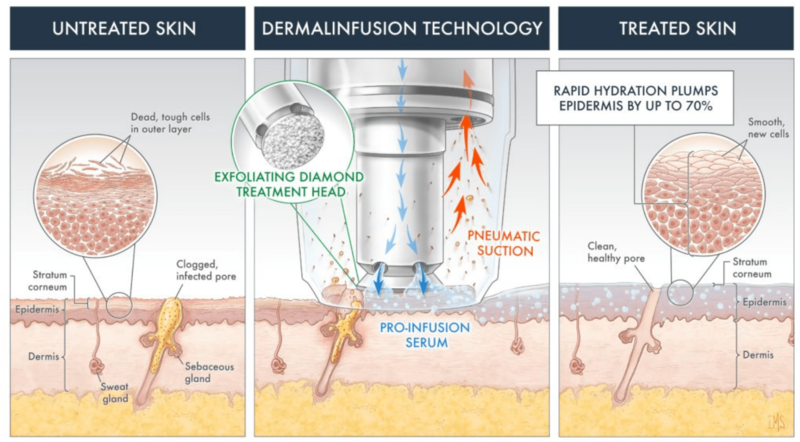 This Silk Peel DermalInfusion graphic demonstrates the exfoliation, extrusion, and serum infusion process. Click to enlarge. The Silk Peel® Dermalinfusion employs cutting-edge peptide technology to improve the appearance of skin discoloration and achieve a more even tone overall. Formulated specifically for delivery with the SilkPeel® Dermalinfusion system, treatment with the Lumixyl Pro-Infusion offers an accelerated approach to brightening the skin that is effective without the irritation of other brightening agents. Chemical skin peels accelerate the removal of dead cells to improve tone and texture for softer, younger looking skin. A chemical peel exfoliates the skin to help improve the effects of aging, blotchy pigmentation, spots and pore size. Patients interested in chemical peel treatments at our Chicago center meet with a skin care specialists to determine the appropriate treatment plan for their unique needs. A medical aesthetician at our practice demonstrates a medical-grade chemical peel. Through the application of chemical solutions, the peel gently removes the outer layer of skin, revealing newer, healthier skin underneath. Medical grade facial procedures purify and nourish your skin. Deep cleansing and steaming cleans, loosens debris and removes dead skin while extractions remove impurities. A custom mask is applied followed by medical grade gels and moisturizers for softer, smoother younger looking skin. Medical grade facials can sometimes be used to complement MicroDermabrasion or chemical peel procedures at our Chicago offices, by helping to maintain skin rejuvenation results achieved through these treatments. Intense but gentle light therapy kills bacteria to help clear pores of debris and prevent future breakouts. The laser emits a wavelength of light that is absorbed by water within the skin which generates heat in and around the sebaceous glands. By creating a mild thermal injury, the UV light alters the structure and function of the sebaceous gland, leading to prolonged acne clearance. Rosacea is a condition that affects millions of people. This condition can range from a slight flushing of the skin to severe acne like inflammation. Although there is no cure for rosacea, there are several ways to help control and in most cases reduce the redness. The first is to start with our own medical grade skincare products specifically for rosacea. These are calming non irritating products. The second is to have a series of IPL or photofacials. These treatments help correct the vascular imbalance in the skin. Along with the Iriderm laser for vascular lesions, one can achieve amazing results. For more information on advanced injectable facial rejuvenation and skin rejuvenation treatments at our Chicago and Winnetka centers, please contact Whole Beauty® Institute today to schedule a consultation.